From the 1996 stop motion film James and the Giant Peach directed by Henry Selick comes this screen used full scale articulating seagull puppet. There was multiple seagulls used in the film some being background which were smaller scale and did not have armatures. This particular seagull would be considered a hero as it is full scale and has an armature allowing him to be posed in various positions for different scenes in the film. 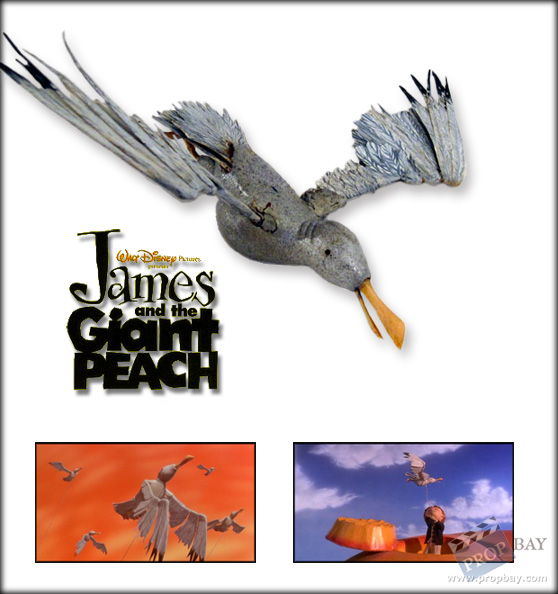 The seagulls can be seen in various scenes in the film carrying the peach around on its long journey. Added: 10-16-2011 - Viewed: 1973 times.